NO! DON’T LOOK! Argh! Too late, you’ve been spoiled! Send your death threats to the address listed on the home page of the site. 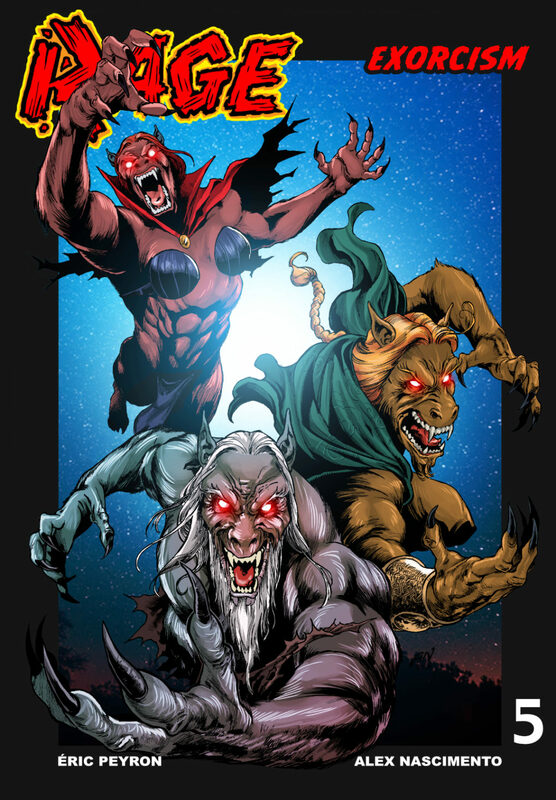 For two issues, Rage, Nicodemus, Ariane, and Tuk have been trying to fight werewolves without even a silver spoon, all the while trying to avoid being bitten. Here is the result. Be there for the end of this multi-part action-packed saga, featuring three new werewolves you didn’t expect! This issue will be available only in digital. It will be compiled with Issue #6 into a printed book as soon as it is finalized. If you prefer print over digital, go to the Rage Compilation section.